Media mogul, producer, actress and philanthropist Oprah Winfrey officially named Holland America Line’s Nieuw Statendam in a ceremony focused on unity and the transformative power of travel. 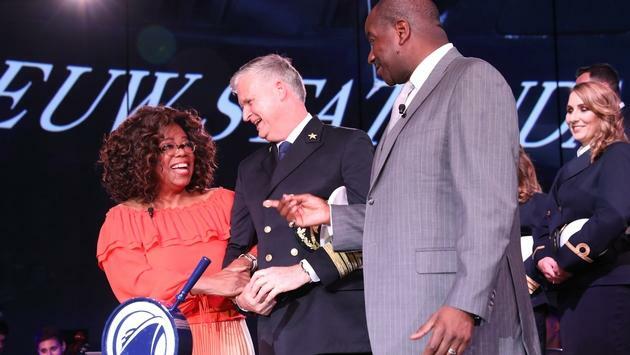 Fresh from a hugely successful Caribbean cruise for “O, The Oprah Magazine,” Winfrey starred in the shipboard festivities Saturday afternoon at Fort Lauderdale, Florida’s Port Everglades. A travel professional and three crew played key roles in the ceremony, sharing their personal stories of transformation by travel. Capt. Sybe de Boer recapped the “expertise, passion and skill” of thousands of workers and artisans that it took to create a ship like Nieuw Statendam. Tamarind restaurant dining host Dee Dewi was born in Bali and expected to spend her life taking care of the family farm. But after tragedy struck nine years ago, a friend suggested she apply to work for Holland America Line. Since then, she’s been able to send her brother and sister to school and bought a house for her parents, all before turning 30. “I’m very proud of it,” she said, adding that she even met her fiancé, a Canadian, on board. Nieuw Statendam is the sixth ship in Holland America Line’s long history to carry the Statendam name. The first came 25 years after the company’s founding, the second served as a troop carrier during World War II, and the fourth was the first Holland America ship to sail a world cruise.